Innovative coaching techniques and in-house training are injecting new life into a Portsmouth school. 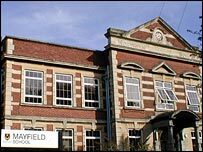 In May 1999, the Mayfield School, a mixed comprehensive in North End, was placed in "special measures" after an Ofsted inspection said it was failing to provide an acceptable standard of education. There was also a staffing crisis to contend with. By the end of 2001, there were 12 vacancies due to long-term sickness or permanently unfilled posts. The school was forced to work on a reduced timetable, with students losing up to one day's schooling per week. More than 30% of the students at Mayfield have special educational needs - the national average is about 20%. It all added up to very "challenging circumstances". Michael Harbour, the advisory head teacher who has worked with the school since November 2000, said: "When schools are put in special measures, they can become tense, frightened places because of inspection overload. Trainee Wanda Barnes (right) in her "trio"
"We had to develop strategies to restore teacher confidence." Training became an immediate priority. During 2002-03, the school took on 17 untrained teachers, aiming to support them through the graduate teacher training programme to achieve qualified teacher status. A staff training room was set up, where regular training sessions were held for new and existing members of staff on all aspects of teaching and learning. Consultancy work at a school in Dominica, in the Caribbean, inspired Mr Harbour to make use of peer coaching and mentoring. He said: "Coaching is all about helping people to find ways to develop their skills. "For teachers, that means looking at their practices, with the help of sympathetic colleagues, and modifying them to improve their performance. "In Dominica, I'd seen how very small adjustments could make a huge difference to teachers' practice and thought 'why not try it here?' "
Teachers at Mayfield are organised into "coaching trios" of colleagues from different subject areas, with varying levels of experience, to work together on teaching and learning. Mr Harbour said: "We don't want teachers to feel they are being assessed or inspected, which is one of the reasons why the trios are made up of teachers from different subject areas. "It's a non-threatening way of developing good practice across the curriculum." Coaching trios meet formally and informally to develop their practice, working together in a variety of ways, including observing one another using a specific skill in the classroom. Wanda Barnes, a newly-qualified English teacher who completed the graduate training programme at Mayfield last year, said: "It's been great to receive structured support from a well-organised training programme. "The training and the coaching programme is designed to create confident, classroom teachers." The impact of coaching on the school has been dramatic. HMI inspectors revisited the school and withdrew the special measures in November 2002. Their report drew particular attention to the good practice of trainee teachers. Michelle Woolgar, a mathematics trainee, believes the coaching process allows trainees to take risks and learn from their mistakes. "Teaching can be challenging, but the coaching is a great support. It stops you from feeling isolated," she said. But it is not only trainee teachers who benefit from the process. Experienced art teacher Vicky Whitlock said: "I've actually learned a lot about interacting with students and building rapport. "Everyone has something to learn from others, however experienced you are." Four years on, Mayfield is fully staffed and continues to make significant improvements. Advisory head Michael Harbour said: "It will be several years before the full impact of coaching is fully reflected in examination results, but improvements have already been made. "What we do have now are confident classroom teachers who are continually improving their skills. Good teachers never stop learning."